Romain Gauthier,Insight Micro-Rotor Natural Titanium and Black Titanium blend ultra high-end horology – an oh-so-finely-finished, in-house automatic movement featuring 22k gold bidirectional micro-rotor, all on show – with a perfectly executed 39.5mm Grade 5 titanium case that is light and sturdy, yet very easy on the eye. Horological sublimity and stylish wearability rolled into one. 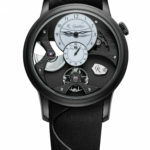 Perhaps this is none more so than with Romain Gauthier, Insight Micro-Rotor Natural Titanium and Black Titanium which combine the ergonomy of a casually-styled, modestly-sized titanium case with a spectacular manufacture movement that is efficient, powerful, uncomplicated (for the better) and highly visible (even dial side). Sweeping around the centre of the dial are small seconds surrounded by an hour-minute subdial at 12 o’clock, beating balance at 6 o’clock and, at 9 o’clock, the swaying micro-rotor, framed by a cut-out in the mainplate. This compact oscillating weight turns fluidly and noiselessly between two bridges, each fitted with a friction-minimising, wear-resistant ruby bearing. In whichever direction the micro-rotor swings, it winds a serially operating double mainspring barrel that, when fully wound, provides 80 hours of power. 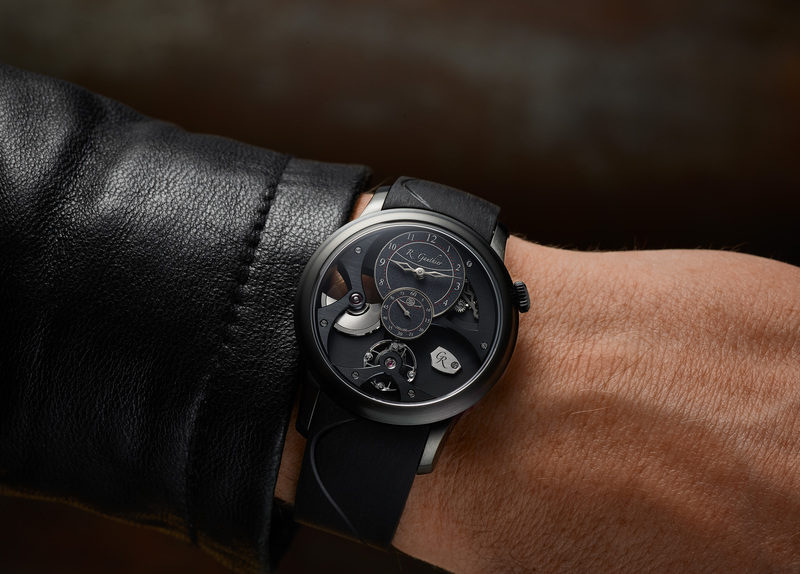 There are more stunning views of the movement through the display back: The sinuous shapes of the hand-bevelled, hand-polished bridges – secured using Romain Gauthier’s signature S-slot screws – are juxtaposed by the linear plaquettes adorning them, while the gears and ratchets stand out for their circular arms that have been bevelled. Part of these timepieces’ splendour lies in the contrasts created by the various finishes applied: Light and dark, polished and satin-finished, straight-grained and hand-frosted. For Insight Micro-Rotor Black Titanium, the bezel, lugs and caseback of the ADLC titanium case are satin-finished, with the caseband polished. Both the bridges and mainplate are black NAC-treated but the straight-graining on the bridges makes them stand out against the hand-frosted mainplate. The same hand-frosting technique has been used to give the oven-fired enamel dial an eye-catching matte finish. Insight Micro-Rotor Natural Titanium and Black Titanium are both available in three 10-piece limited editions: with oven-fired white enamel dial, oven-fired black enamel dial and oven-fired blue enamel dial. 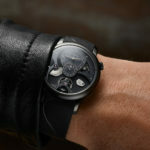 Strap options include casual matte black alligator leather and supple black natural rubber. 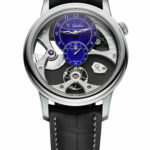 When Romain Gauthier founded his eponymous brand in 2005, for the first six years he channelled his profound grasp of traditional Swiss watchmaking savoir-faire into creating majestic timepieces boasting innovatively engineered, exceptionally finished in-house movements in sumptuous cases crafted from the noble metals of gold and platinum. These creations were the bedrock on which Gauthier built his company. And so, when he launched his first titanium timepiece, Prestige HMS Natural Titanium, in 2011, it was at first met with a degree of resistance from the community of high-end collectors. 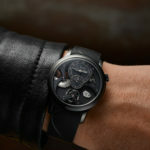 Five years later, when he created Logical One Natural Titanium and Black Titanium, Gauthier still felt that most ultra high-end collectors were enjoying their timepieces in gold, platinum or stainless steel. Titanium seemed like a step too far for many. And they did come. Since 2017, a large number of collectors have bought Logical One Natural Titanium and Black Titanium, with Prestige HMS Natural Titanium and Black Titanium getting a significant look-in too. If ever there was a Romain Gauthier in-house calibre that was asking to be accompanied by a titanium case, it is Insight Micro-Rotor. 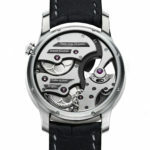 This automatic movement’s efficiency and simplicity are perfectly complemented by the wearability of titanium. The case’s 39.5mm diameter already ensures a neat fit on the wrist, with the lightness of the titanium only serving to enhance that comfort. 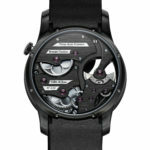 Impressive design details of the case include a lip in the caseband that flares out to meet the bezel; the crown placed at 2 o’clock to free up space for wrist movement; and the bombé sapphire crystal which gradually rises so its highest point is over the hour-minute display – the true centre of the dial in Romain Gauthier’s eyes. 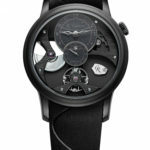 Romain Gauthier has designed Insight Micro-Rotor’s movement to be highly visible so the viewer can gain an instant appreciation of the spectacular mechanics and fine finishing, giving rise to the name “Insight”. The labour-intensive decoration includes hand-made and hand-polished bevels, snailing, straight-graining, circular-graining, hand-frosting as well as hand-made and hand-polished jewel countersinks. 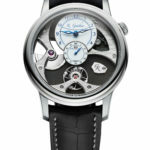 “The extreme visibility of the movement both dial side and through the display back means that we take care to hand-finish this micro-rotor calibre all over,” says Gauthier. And it is this level of hand-finishing that helps to explain why Insight Micro-Rotor is one of the most expensive micro-rotor timepieces – if not the most expensive micro-rotor timepiece – in the world. Insight Micro-Rotor’s movement was designed, developed, produced, decorated, assembled and regulated at Manufacture Romain Gauthier in the Vallée de Joux, Switzerland. Given the relative weight of the micro-rotor (4.3g/0.15oz), Gauthier has decided to eschew a ‘flying’ rotor supported by just one bridge from beneath and instead design the micro-rotor so it is sandwiched between two bridges, from above and from below, for superior stability. The movement’s two mainspring barrels combine to offer 80 hours of energy at full wind. The barrels are in series for more constant power to the regulator that features the Romain Gauthier balance wheel with curved arms and calibrated eccentric weights plus hand-assembled pallet lever that is triangular for maximum rigidity.